A long time ago (3 years actually, but at my age…), Robin Fullmer wrote to me about a program on a Jewish emigree to New Zealand, I did some research and came up with this post which extended into this series. Fast forward a few months and I get a mail from Stephen Galloway, Senior Features Editor at The Hollywood Reporter and acknowledged as one of the finest journalists in his field. He’s stumbled over my work and asked if I could point him in the direction of someone who could help him research a Mainz Jewish family whose daughter is the subject of a biography he’s writing. That researcher turned out to be me and I’ve had a fascinating ride over the past few years, digging up some really interesting stuff, meeting Stephen and his client (one of the most powerful women in Hollywood) and some other wonderful people. 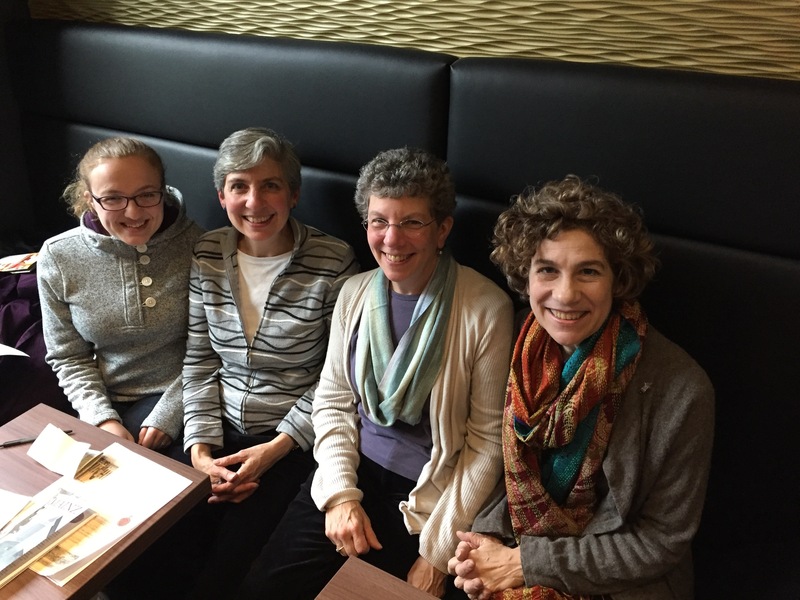 From right to left: Naomi Lewin, graduate of Yale and the Peter Cornelius music conservatory in Mainz and host of classical programs on NPR’s WQXR in New York, Eva Radding, graduate of Yale and librarian at facinghistory.org, Miriam Lewin, graduate of …you guessed it… Yale and president of Lavine Production Group, a film and television production company and Lisa Radding (Eva’s daughter) graduate of…Syracuse University… and ‎Director of Research and Product Development at Ethnic Technologies. They’re in town for the laying of the Stolpersteine for their great-grandparents, Simon and Juliana Gaertner, pictured in Mainz at the time of their golden wedding in 1937, together with their son Willi, daughter-in-law Johanna and granddaughter Elsbeth, mother and grandmother of the lovely ladies I met at their hotel yesterday. I’ll be there to honour a woman who lost two sons in world war 1, berated the Gestapo who had arrested Willi after Kristallnacht with the words “My other two sons gave their lives for Germany in the Great War, you’re not taking this one from me” and securing his release and who was deported and murdered at age 83. 13 Oct	This entry was published on 13 October, 2015 at 08:00. It’s filed under History, Mainz and tagged Simon and Juliana Gaertner, Stephen Galloway, Stolpersteine. Bookmark the permalink. Follow any comments here with the RSS feed for this post. Older: Who needs New England? Quite a path for them- and by extension you- to follow. Please do so for me as well. Thank goodness for researchers who keep the stories alive, and for the families who do the same.